“Deep Space Climate Observatory (DSCOVR) (formerly known as Triana, unofficially known as GoreSat) is a NOAA Earth observation and space weather satellite launched by SpaceX on a Falcon 9 launch vehicle on February 11, 2015 from Cape Canaveral. “It was originally developed as a NASA satellite proposed in 1998 by then-Vice President Al Gore for the purpose of Earth observation. It is in a Lissajous orbit at the Sun-Earth L1 Lagrangian point, 1,500,000 km (930,000 mi) from Earth, to monitor variable solar wind condition, provide early warning of approaching coronal mass ejections and observe phenomena on Earth including changes in ozone, aerosols, dust and volcanic ash, cloud height, vegetation cover and climate. At this location it will have a continuous view of the Sun and the sunlit side of the Earth. The satellite is orbiting the Sun-Earth L1 point in a six-month period, with a spacecraft-Earth-Sun angle varying from 4 to 15 degrees. It will take full-Earth pictures about every two hours and be able to process them faster than other Earth observation satellites. “DSCOVR started orbiting around L1 by June 8, 2015, just over 100 days after launch. “Originally known as Triana, named after Rodrigo de Triana, the first of Columbus’s crew to sight land in the Americas, the satellite’s original purpose was to provide a near-continuous view of the entire Earth and make that live image available via the Internet. Gore hoped not only to advance science with these images, but also to raise awareness of the Earth itself, updating the influential Blue Marble photograph taken by Apollo 17. In addition to an imaging camera, a radiometer would take the first direct measurements of how much sunlight is reflected and emitted from the whole Earth (albedo). This data could constitute a barometer for the process of global warming. The scientific goals expanded to measure the amount of solar energy reaching Earth, cloud patterns, weather systems, monitor the health of Earth’s vegetation, and track the amount of UV light reaching the surface through the ozone layer. “Triana was removed from its original launch opportunity on STS-107 (the ill-fated Columbia mission in 2003). The $100 million satellite remained in storage for the duration of the Bush administration. In November 2008 the satellite was removed from storage and began recertification for a possible launch on board a Delta II or a Falcon 9. Al Gore used part of his book Our Choice (2009) as an attempt to revive debate on the DSCOVR payload. The book mentions legislative efforts by Senators Barbara Mikulski and Bill Nelson to get the satellite launched. 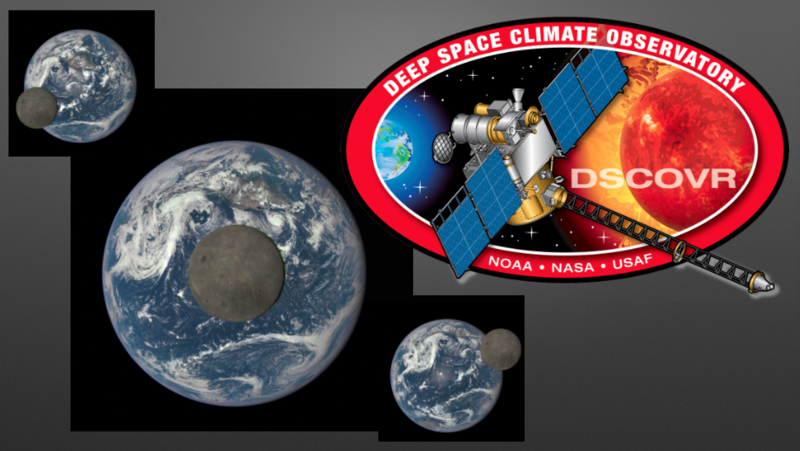 NASA renamed the satellite Deep Space Climate Observatory (DSCOVR), in an attempt to regain support for the project. In February 2011, the Obama administration attempted to secure funding to re-purpose the DSCOVR spacecraft as a solar observatory to replace the aging Advanced Composition Explorer (ACE) spacecraft. Exploration Mission 1 or EM-1 (previously known as Space Launch System 1 or SLS-1) is the first planned flight of the Space Launch System and the second uncrewed test flight of the Orion Multi-Purpose Crew Vehicle. 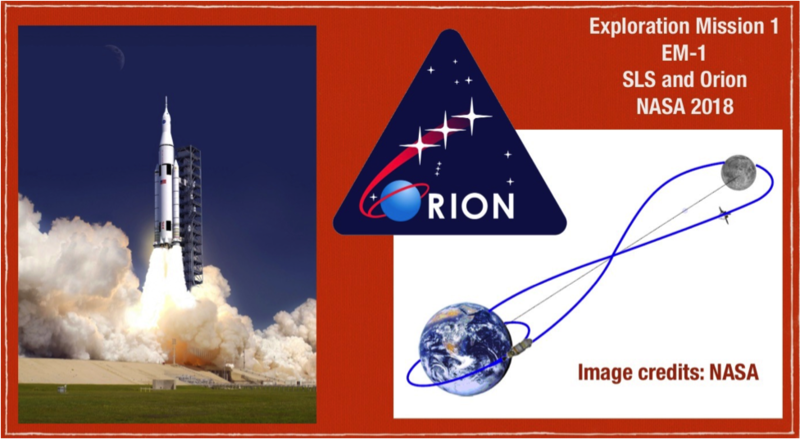 As of December 2014, the launch is projected to occur September 30, 2018 from Launch Complex 39B at the Kennedy Space Center, and the Orion spacecraft would perform a circumlunar trajectory during the seven-day mission. It is planned to be followed by Exploration Mission 2. Image collection: Douglas Yazell. Image credits: NASA. Image collection: Douglas Yazell. Image credits: The European Space Agency (ESA). “ROSETTA-PHILAE: CHURY REVEALS ITSELF TO BE… DIFFERENT! “The comet rendezvous mission of Rosetta offered, thanks to the landing of Philae on 12 November 2014, an exceptional opportunity: that of the in situ study of a comet nucleus (from its surface to its internal structure), 67P / Churyumov-Gerasimenko (aka Tchouri, or Chury). It is likely to advance understanding of these small bodies, witnesses to the origins of the solar system. Measurements taken from November 12 to 14, 2014 (during the 63 hours that followed the separation of Philae from Rosetta) by the 10 instruments of the Philae lander complemented the observations made by the Rosetta orbiter. And its eventful arrival at the comet was even a source of additional information. “25 minutes after initial contact of Philae with the core of the comet, COSAC (Cometary Sampling and Composition experiment) conducted a first chemical analysis in “sniffer” mode, that is to say, by examining the particles passively made to enter the device. These particles likely originated in the dust cloud generated by the first contact with the ground by Philae. 16 compounds have been identified, divided into 6 classes of organic molecules (alcohols, carbonyls, amines, nitriles, amides and isocyanates). Among them, 4 are detected for the first time on a comet (methyl isocyanate, acetone, propionaldehyde and acetamide). “These molecules are the precursors of important molecules for life such as sugars, amino acids, or bases of DNA. But the presence of these more complex compounds could not be identified unambiguously in this first analysis; also, the temperature was without doubt not sufficient to force these compounds to sublimate and be collected by COSAC. Moreover, essentially all of the detected molecules are potential precursors, products, assemblies, or by-products of each other, giving an insight of the chemical processes at work in a comet nucleus and even in the protosolar cloud, in the early days of the solar system. “COSAC identified a large number of nitrogen-containing compounds, but no sulfur compound, contrary to what was observed ROSINA (Rosetta Orbiter Spectrometer for Ion and Neutral Analysis) instrument on board Rosetta. This suggests that the chemical composition differs depending on the sampled area. “Its side instrument PTOLEMY (an evolved gas analyser, which obtains accurate measurements of isotopic ratios of light elements) has detected the major components of the “crown” of the comet, such as steam, and carbon-containing compounds such as formaldehyde, which is also one of the precursors of the prebiotic molecules. “The lander first hit the surface at a place called Agilkia and then bounced several times before reaching the site called Abydos. The trajectory of Philae and the data recorded by the instruments of Philae show that Agilkia is composed of granular materials over about twenty centimeters, while Abydos has a hard surface. “On the other hand, the interior of the comet appears more homogeneous than predicted by the models. CONSERT (Comet nucleus sounding experiment by radio transmission) provides, for the first time, access to the internal structure of a comet nucleus. The propagation time and the amplitude of the signals having passed through the upper part of the “head” (the smaller of the two lobes of Tchouri) show that this portion of the core is substantially homogeneous at the scale of tens of meters, which is an important result for models of the formation of comets. These data also confirm that the porosity is high (75 to 85%), and indicate that the electrical properties of the dust are similar to those of carbonaceous chondrites (a type of meteorite). “A panoramic image, where we see in places a foot or an antenna, also revealed the position of Philae. It rests in a hole of its own size, lying on its side (with only 2 of its 3 feet making ground contact) and surrounded by walls that complicate its solar power supply and its communications with Rosetta. “The instrument CONSERT has meanwhile determined with three observation periods, with direct visibility between Rosetta and Philae, the area (150 meters by 15 meters) where Philae is located. This facilitated the reconstruction of the trajectory of Philae between the first contact site Agilkia and the final landing site Abydos. Then, using the signals that passed through the interior of the comet, CONSERT reduced the uncertainty of the location of Philae (on the edge of the area called Hatmehit) to a band measuring 21 meters by 34 meters. “The RMOC (Rosetta Mission Operations Center, at ESOC, the European Space Operations Center) and SONC (Science Operations and Navigation Center) of CNES have attempted to reconstruct the trajectory of Philae between landing and final stop; these two reconstructions are slightly different, the trajectory given by the SONC showing more of a rebound than the RMOC a few meters before the final stop. The exact position of Philae could not be determined unambiguously from orbit, even though some images of the WAC (Wide Angle Camera) of Rosetta show a fairly bright spot compatible with the position indicated by CONSERT. Besides the SONC of CNES, 10 French laboratories are involved in these analyses and scientific publications. Here is a link (Philae’s Scientific Harvest May Be Its Last) for the related article (in English) from Science, the magazine of the American Association for the Advancement of Science (AAAS). Rosetta is a robotic space probe built and launched by the European Space Agency. 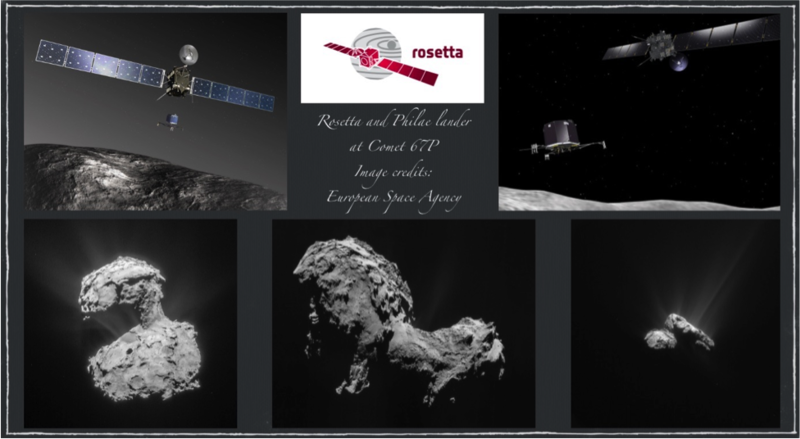 Along with Philae, its lander module, Rosetta is performing a detailed study of comet 67P/Churyumov–Gerasimenko (67P). It also performed a flyby of Mars and the asteroids 21 Lutetia and 2867 Šteins. On 12 November 2014 the mission performed the first successful landing on a comet. As of 2015, the mission continues to return data from both orbit and the comet’s surface. I borrowed a copy of this book from a public library after a friend told me about the author’s April 24, 2015 appearance on the National Public Radio show Science Friday with host Ira Plato. Listening to that online, he says Lovelace and Babbage were planning to build the world’s first computer as a steam-powered machine! Ada Lovelace (1815-1852, the first computer programmer) was the daughter of the famous poet Lord Byron. Charles Babbage (1791-1891, originator of the concept of the programmable computer) was very famous and a great friend of Ada Lovelace. Babbage hosted many large parties at his London home with a guest list including many famous people. Babbage created plans for a Difference Machine to calculate logarithms for error-free tables of that data, and plans for an Analytical Machine to perform all of arithmetic. Lovelace was trained as a mathematician in order to avoid the bad influence of writing poetry, since her famous father had a bad reputation in some ways. The woman (Suw Charman-Anderson) who created (in 2009) the annual celebration Ada Lovelace Day (celebrating the achievements of women in science, technology, engineering and maths) was talking to a woman, Sydney Padua, whose day job is computer animation, telling her to write personal blog entries about Ada Lovelace. That led Padua to use her idle evening hours to create a webcomic (2dgoggles.com) about Lovelace and Babbage. By the way, I laughed when I saw Padua’s 2-minute 2004 video Agricultural Report at sydneypadua.com. She was learning to do computer animation, but the movie was entered in more than 100 film festivals. Padua’s book creates an imaginary universe, her pocket universe, where Lovelace and Babbage built the steam-powered Difference Engine and Analytical Engine. The book presents short stories we would expect from a graphic novel that started as a webcomic, but her stories contain extensive historical footnotes infused with Padua’s sense of humor on every page. The result is a unique graphic novel for people of all ages. From 1998 to 1992, part of my long (1981-2011) Honeywell aerospace career was guidance, navigation and control work for NASA’s Space Station Freedom in Huntington Beach, California, at the McDonnell Douglas site (work led by David Barrows and John Harduvel). NASA chose the Ada computer programming language (named for Ada Lovelace) in place of FORTRAN, C, and other candidates. From 1977 to 1983, a Honeywell-led team created this Ada language for the Department of Defense of the USA. A complete Babbage Difference Engine was finally built from his plans in the year 2000. Padua writes that Babbage’s rambling autobiography, Passages from the Life of a Philosopher, is highly entertaining, and that we should read it as soon as we finish reading her graphic novel. Padua talks about quaternions (mathematical operators) a few times in her graphic novel, including a chapter called Imaginary Quantities, where we meet quaternion creator William Rowan Hamilton, a terrible poet, despite his genius for mathematics and other subjects. We use quaternions in our aerospace work, including NASA projects such as the International Space Station (ISS), the space shuttle (though not in the entry phase), and the Orion crew capsule, but not Apollo, Gemini, and Mercury. Padua is familiar with the use of quaternions in computer animation; for example, keeping track of an object’s orientation. Our Honeywell coworker Tom Gederberg collected quaternion papers after the start of his Honeywell career in 1979, calling it the Hitchhiker’s Guide to Quaternions- Don’t Panic! One paper explained that despite the lack of any use for quaternions, they were so popular in Hamilton’s lifetime that people often enjoyed large quaternions parties in their homes. Charles Dickens knew Lovelace and Babbage well, Padua explains, and she mentions in a footnote that the inventor of a mysterious mechanism in Little Dorrit (a Dickens novel), Mr. Doyce, is generally agreed to be based if not on Babbage, at least on Babbage’s situation with government grants. A Padua footnote explains that planet Uranus was first named George by its discoverer, William Herschel (father of Babbgae’s best friend, John Herschel) in 1781. Or specifically, “The Georgian Planet,” after King George III. She continues, “There was an international (that is, largely French) outcry against such an unclassical name, so the new planet was renamed in the 1790s, though it was still George until 1850 in Her Majesty’s Nautical Alamanc. Padua is originally from the Canadian Prairie and now lives in London with her husband and too many books. Her new graphic novel is highly recommended. Five subjects are on my mind for this short installment in this series. The upcoming AIAA Houston Section dinner meeting of Tuesday, November 3, 2015, featuring the 2007 Nobel Peace Prize laureate Bruce McCarl, PhD, of Texas A&M University, College Station Texas USA, talking about climate change science & public policy. The massive, open, online course (MOOC) was the precursor for the 2015 book of the same name, The Age of Sustainable Development, by Jeffrey D. Sachs, PhD, of Columbia University. Climate change is sometimes 1 of 9 subjects, but it tends to dominate the other 8 subjects. I completed week 7 of 15 weeks so far. Like my first MOOC (described in my prior column), it requires about 2 hours per week of study. Listen to the week’s lectures, then take a weekly quiz. Correct answers for 8 of 10 questions are required, and we can take the quiz 3 times. The United Nations Millennium Development Goals (MDGs) were well addressed from 2000 to 2015, and the second set of MDGs will use the time frame of 2015 to 2030, where one goal is to eliminate extreme poverty. The course’s Week 7 discussed the Universal Declaration of Human Rights supported so much by Eleanor Roosevelt, adopted by the United Nations in 1948. The title of lectures from Week 7 is Human Rights and Gender Equality. The title of the Lecture 1 is The Ethics of Wealth, Poverty, and Inequality. Utilitarianism was a secular philosophy popular starting at the end of the 18th century, promoted by Jeremy Bentham, with a goal of social happiness, and the greatest happiness for the greatest number of people. Libertarianism is an extremist free-market philosophy. The roots are in authoritarianism and totalitarianism, but they go farther by saying it is wrong to suggest the rich should give something to the poor, and they oppose taxes that redistribute wealth in society. The Human Rights philosophy says every person has 5 basic human rights; civil, political, economic, social, and cultural. The online course is excellent (and free of charge). Texas Climate News. The link is easy to remember: texasclimatenews.org. The most recent headline (August 26, 2015) matches the title of this regular column (Climate Change & Local Responses) well, referring to the territory of AIAA Houston Section, including College Station Texas USA and Texas A&M University. The Texas Climate News headline is, “Texas Cities Make Climate-Action Strides, Bypassing State Leaders.” The Texas Climate News founding editor is Bill Dawson, and the website’s 2015 reboot is excellent after its start in 2008. Our AIAA Houston Section survey last year (July 1, 2014 through June 30, 2015) included one item about climate change. We were happy to receive 83 responses. That is about 10% of our membership. The results were bad news for climate science deniers. What is your conclusion about climate change? 67%: Human-induced climate change requires urgent action. [A reminder, not included on the survey; that is the title of the 2013 position statement of the American Geophysical Union (AGU). Their statement was revised and reaffirmed a few times since 2003. Gerald R. North, PhD of Texas A&M University led the panel of 14 experts who created this revision, and the 62,000 members of AGU had a chance to comment.] 18%: Climate change is human-induced but is a minor problem. 12%: Climate change is not human-induced. 3%: Climate change is not a problem at all. An upcoming dinner meeting for AIAA Houston Section; Date: Tuesday, November 3, 2015. Time: 5:30 PM to 8:30 PM. Place: NASA/JSC Gilruth Center Alamo Ballroom. Guest of honor: Bruce McCarl, PhD, 2007 Nobel Peace Prize laureate, Texas A&M University. Subject: Climate change science & public policy. A YouTube video’s introduction says Dr. McCarl wrote 9 books and more than 250 journal articles. He is Regents Professor and Distinguished Professor of Agricultural Economics. One idea is to start an hour of presentations with a 20-minute presentation by a NASA/JSC robotics leader talking about using DEXTRE (also called SPDM, Special Purpose Dextrous Manipulator) to install a climate change instrument (RapidScat) on the International Space Station (ISS). RapidScat is the 4th of 8 planned climate science instruments to be placed on ISS. CATS (Cloud-Aerosol Transport System), the 5th, is already installed. The 8th, planned for 2018, is GEDI (Global Ecosystem Dynamics Investigation Lidar). That’s all for this installment. See you next issue here in Horizons, the newsletter of AIAA Houston Section. The anniversary date for this museum goes back to September 28, 1940, so let us join our colleagues there soon as we celebrate the building’s 75th anniversary. AIAA Houston Section finally enjoyed a dinner meeting there on June 18, 2015, our Section annual awards dinner. The image montage for this dinner meeting is created using photos taken by me, Douglas Yazell, except for the image of the museum taken from the parking lot, a photograph taken from the museum’s website. Outgoing Section Chair Michael Martin showed a slide with election results; Alan Sisson, Chair, Jennifer Wells, Chair Elect, Fred Oullette, Treasuruer, Lea Hougland, Secretary, Justine Wiles, Vice Chair Technical, Ashley Nelson, Vice Chair Operations, Laura Sarmiento, Councilor 1, Douglas Yazell, Councilor 2, William “Bill” West, Councilor 3, Zach Tejral, Councilor 4, and Ryan Miller, Councilor 5. Dinner meeting caption: Top left: Jayant Ramakrishnan, AIAA Director of our 4-state Region IV (Texas, Oklahoma, Arkansas, and New Mexico). Second photo from top left: two AIAA members celebrating 50 years of membership. On the left is David Henderson. On the right is Norman Chaffee, AIAA Houston Section Chair of 1980-1981. Second photo from top right: an image of the museum’s taken from outside in front of it. Image credit: the museum’s website. Top right: AIAA Houston Section Public Policy Chair Wayne Rast worked on our Section’s award of our Spirit of Apollo Scholarship. The student’s name: Allyson Cook. Bottom Left: Our Section award that money from Yuri’s Night 5 km fun run. As shown in the photo, it is awarded to the Houston Museum of Natural Science. Specifically, the Expedition Center? Second image from bottom left: the 2009 AIAA Historic Aerospace Site plaque for the museum. It is shown in a display case for now. Third image from bottom right: Dr. Larry J. Friesen and Honors & Awards Chair Angela Beck. 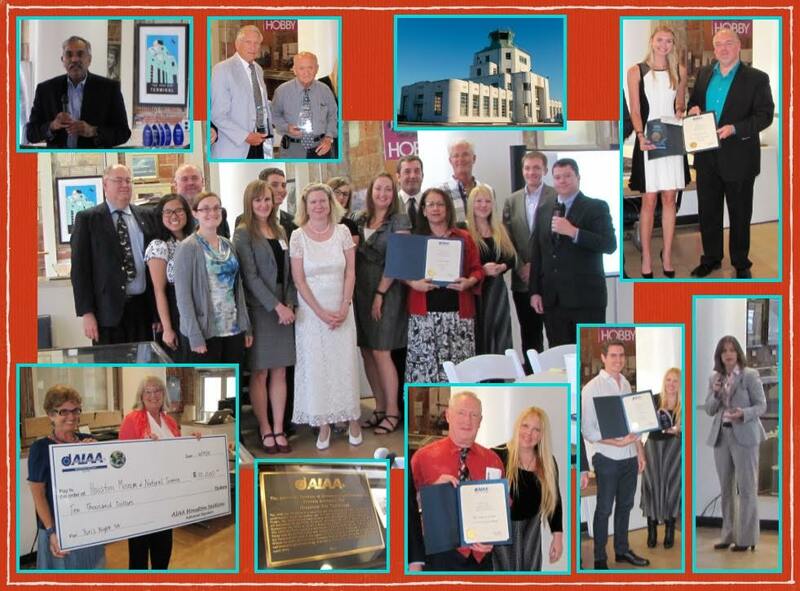 Second image from bottom right: Fred Oullette’s son and Honors & Awards Chair Angela Beck. Bottom right: Dr. Bonnie Dunbar of the University of Houston Cullen College of Engineering and former NASA astronaut. Center image: 2014-2015 AIAA Houston Section Council members from left to right: Councilor and featured dinner meeting speaker Wayne Hale, Webmaster Irene Chan, Public Policy Chair Wayne Rast, Communications Chair Kathleen Coderre, Treasurer Jennifer Wells, Chair Elect Alan Sisson, Councilor Ellen Gillespie, Secretary Lea Hoagland, Programs Chair Laura Sarmiento, Councilor Michael Kezirian (our contact with Apollo astronaut Alan Bean for that dinner meeting), AIAA Houston Section space operations technical committee Chair BeBe Kelly-Serrato, Councilor Douglas Yazell, Honors & Awards Chair Angela Beck, Past Chair Michael Frostad, and Chair Michael Martin. See the organization charts on the AIAA Houston Section website and in Horizons, the newsletter of AIAA Houston Section. 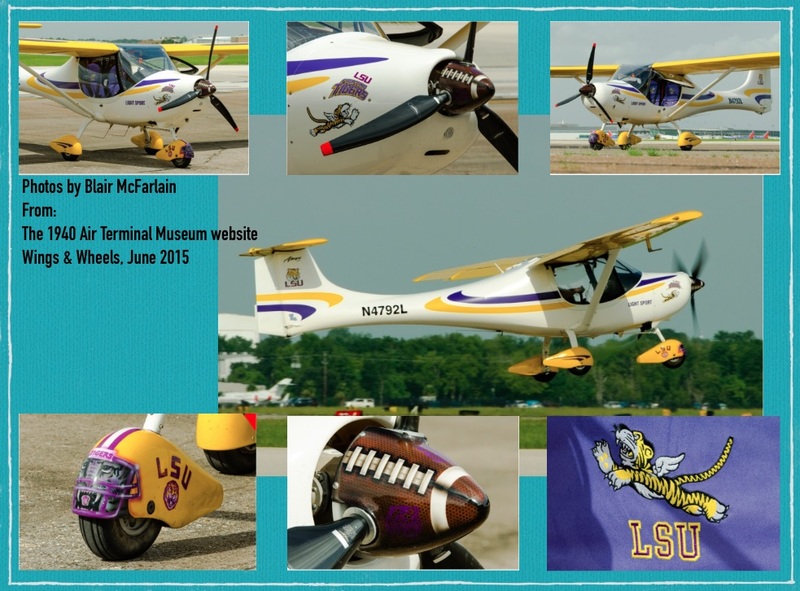 Another image montage is presented here using images from the June 2015 Wings & Wheels event at the museum, showing a small airplane displaying logos from Louisiana State University. A few earlier monthly Wings & Wheels events were rained out. Please look for this regular column about the 1940 Air Terminal Museum here our next issue of Horizons, the newsletter of AIAA Houston Section.